Stories of transplanted tissue and body parts go far back in myth and legend. It is said that in the sixth century, the Christian patron saints of medicine, Cosmos and Damian, performed a transplant. They replaced the cancerous leg of a white man with the healthy leg of a recently deceased black man. In India, skin grafts were done as far back as the sixth century B.C. to replace noses that had been amputated as a penalty for adultery. The Indian process of skin grafting was introduced to Western medicine by Italian surgeon Gaspare Tagliacozzi in the sixteenth century. He attached a skin flap from a patient's forearn to the patient's nose. Several weeks later, he released the arm from the now-repaired nose. Tagliacozzi used the patient's own skin because he felt that foreign body tissue would be rejected. Thus he correctly anticipated what is still the major problem with successful transplantation: rejection of foreign body tissue. Skin grafting was reintroduced in the nineteenth century. In 1869 French surgeon Jacques Louis Reverdin found that successful grafts required thinner tissue. In 1881 Scottish surgeon William MacEwen reported success with bone allografts (transplants from one person to another) in children. Despite these reported successes, most attempts at transplantation failed. Inadequate surgical techniques or rejection by the recipient caused most failures. In 1902 French surgeon Alexis Carrel developed a method of sewing together small blood vessels using tiny needles and fine thread. Carrel and Dr. Charles Guthrie of the University of Chicago performed a series of organ transplants on animals. While the transplants were at first successful and the organs functioned, they ultimately failed. Other experimenters had similar results. Researchers who were experimenting with transplants suspected that the body's immune system was rejecting the implanted organs. They believed that it was the foreign tissue that was the problem. British biologist Peter Medawar became interested in skin graft problems while working with severely burned soldiers during World War II (1939-1945). Medawar found that when a patient received a skin graft for a second time from the same donor, the second graft was rejected twice as quickly as the first had been. To Medawar, this clearly indicated an immune response. Further experiments revealed that grafts between twins were not rejected. In 1954 Medawar went on to prove that immune tolerance was acquired during an embryo's development. Injection of foreign substances into embryonic or newborn mice would produce permanent tolerance to those substances later in life. In other words, the mouse's body would forever recognize such a substance as "self," instead of responding to it as a foreign invader in need of destruction by the immune system. Surgeons continued to experiment with transplants. They focused their efforts on the kidney because of its relatively simple blood supply system. In 1933 Russian surgeon Yuri Voronoy performed the first human kidney transplant in Kiev, Ukraine. This kidney transplant, like those performed in cities throughout the world all failed. One patient, a 26-year-old Boston doctor, lived for six months with his new organ. A Boston team finally achieved success in 1954. A 24-year-old man was dying of kidney disease. He was referred, along with his twin brother, to the Boston team. The transplant from twin to twin succeeded. The door was now open. The Boston surgical team performed 23 successful identical-twin kidney transplants between 1954 and 1966. However, transplants between non-twins still resulted in rejection. Attempts to suppress the immune response by radiating (exposing to X-ray) the recipient's body and the donated organ were unsuccessful. In the early 1960s two major breakthroughs finally addressed the rejection problem. Beginning in 1962, it became possible to closely match donor and recipient tissue. This technique markedly decreased the likelihood of rejection in transplantation. 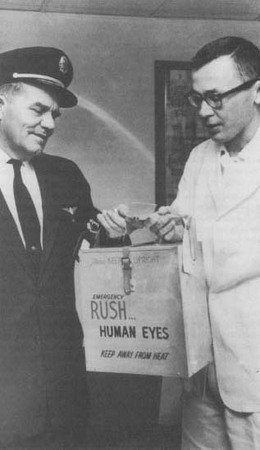 A Trans World Airlines pilot delivers an eye from a San Diego eye bank to a doctor at the Kansas City Medical Center. 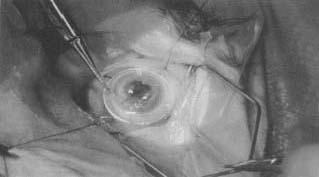 The cornea of the eye was later transplanted into the eye of a patient at the center. era of widespread organ transplantation. Again, Starzl showed cyclosporin to be more effective when used with steroids. The liver remains difficult to transplant because of its complicated blood supply. The first successful liver transplant was performed by Starzl at the University of Colorado in 1967. Cyclosporin greatly improved the outcome of such transplants. The first human pancreas transplantation was performed by Drs. Richard Lillehei and William Kelly of the University of Minnesota in 1966. Physicians found that transplantation of both lungs succeeds better than transplanting a single lung. Because most patients with end-stage lung disease also have serious heart deterioration, heart-lung (both lungs) transplants are sometimes performed. The success of this operation is aided by cyclosporin. The first successful heart-lung transplant was carried out in 1981 at Stanford University Medical Center by Drs. Bruce Reitz and Norman Shumway. Other body parts are now transplanted, but problems remain. Many grafts do not survive permanently. Cyclosporin is very expensive and has serious side effects. Still, a 1992 government report found that organ transplants in the United States were largely successful. Favorable outcome rates vary according to the organ transplanted. I found your literature very interesting but I still didn't find out when was the FIRST SUCCESSFUL skingraph performed and by whom could you send me this information it would be a great help or tell me what site to look on? I need to Know more about this, although this was very interesting. Transplant between 1800 and 1950 were not very successful. Developments in 1954 resulted in an important breakthrough in transplant tecniques. What was this development in 1954? cool job guyss.. this information really speaks about the persue of making human kind better.. there people are a real inspiration bacause they never gave up to help save a life.. and look today there are over hundreds of transplants..